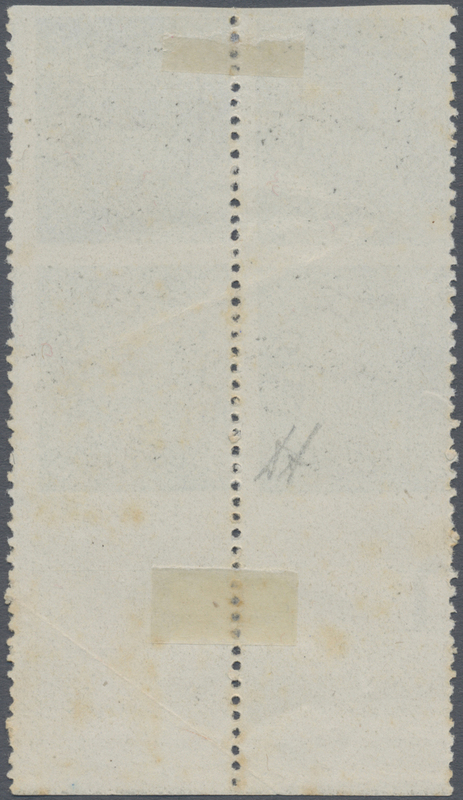 11053 1937. 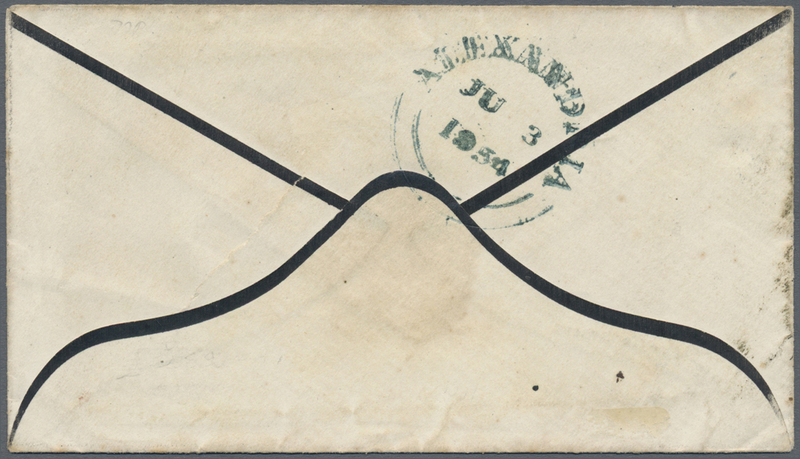 Attractive oversize airmail advertising brochure from Deutsche Lufthansa featuring the Graf Zeppelin LZ127 over Rio de Janeiro. 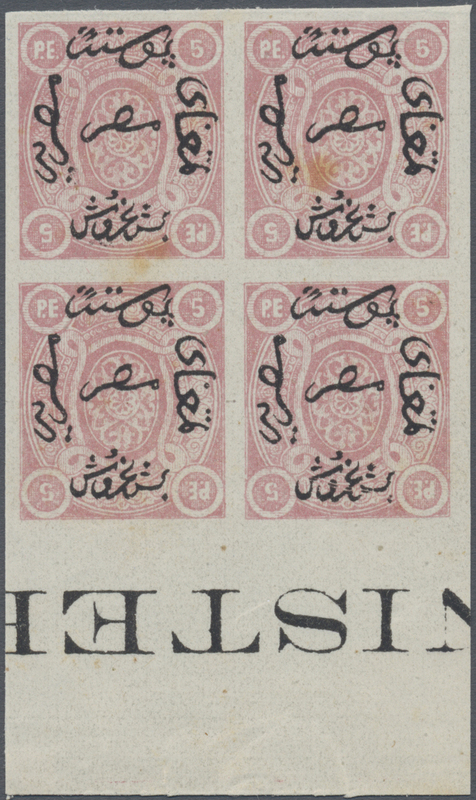 Slightly worn, excellent condition, as per scans. 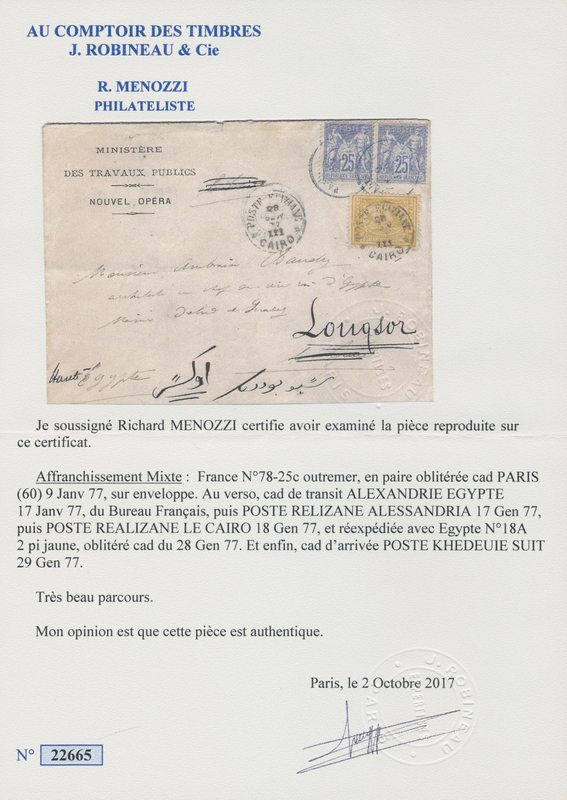 Size 15x21cm closed, opens to a full 59x21cm. 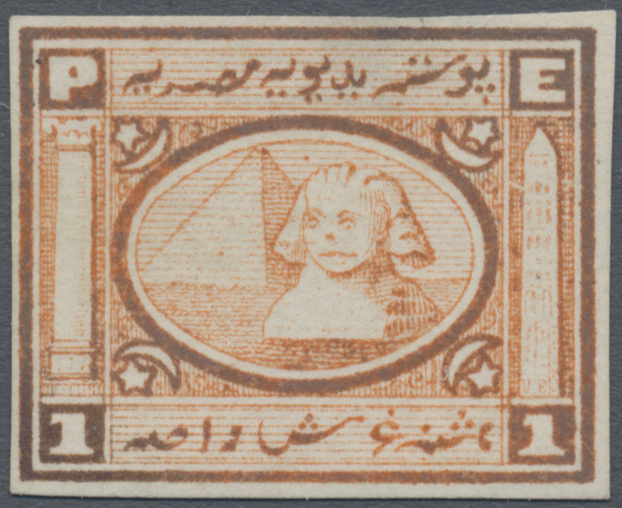 11054 1937. 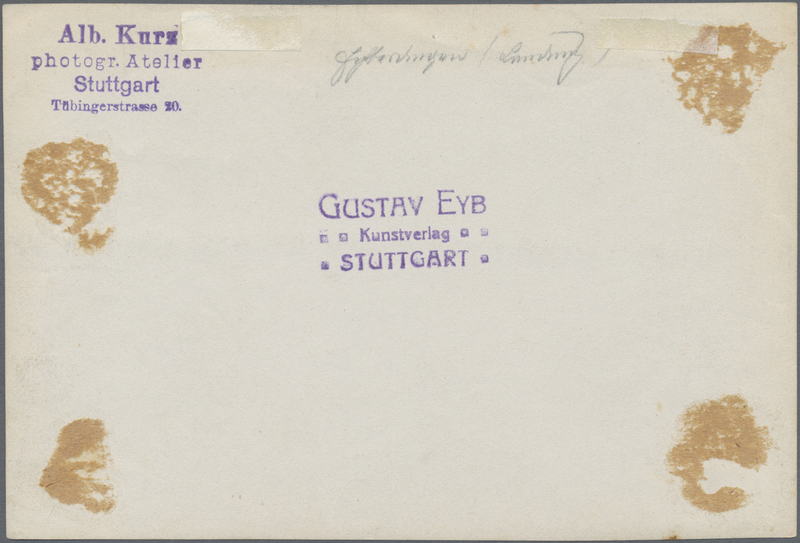 Attractive oversize airmail advertising brochure from Deutsche Lufthansa featuring a Zeppelin and Dornier airplane over the Brandenburg Gate. 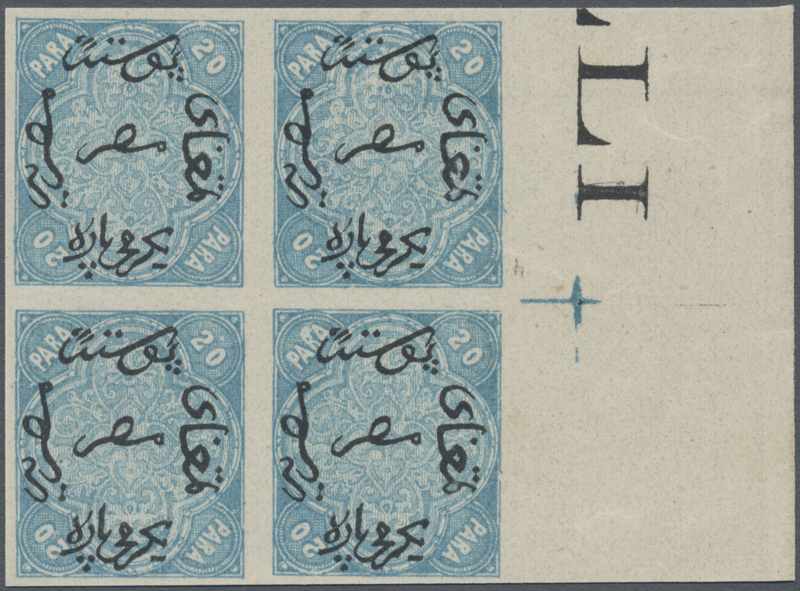 Slightly worn, excellent condition, as per scans. 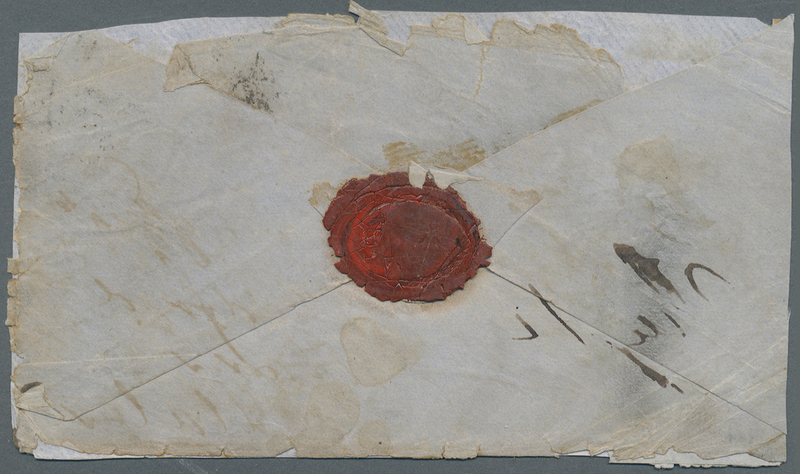 Size ca 15x12cm. 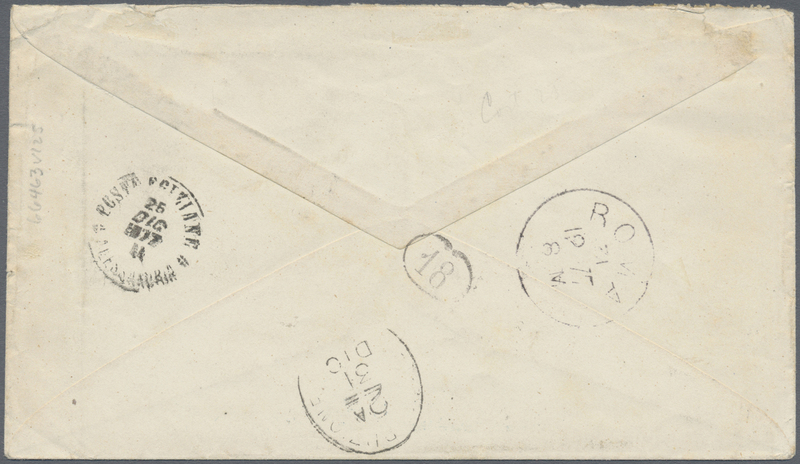 19 pages of tariffs, times, and other pertinent airmail information. 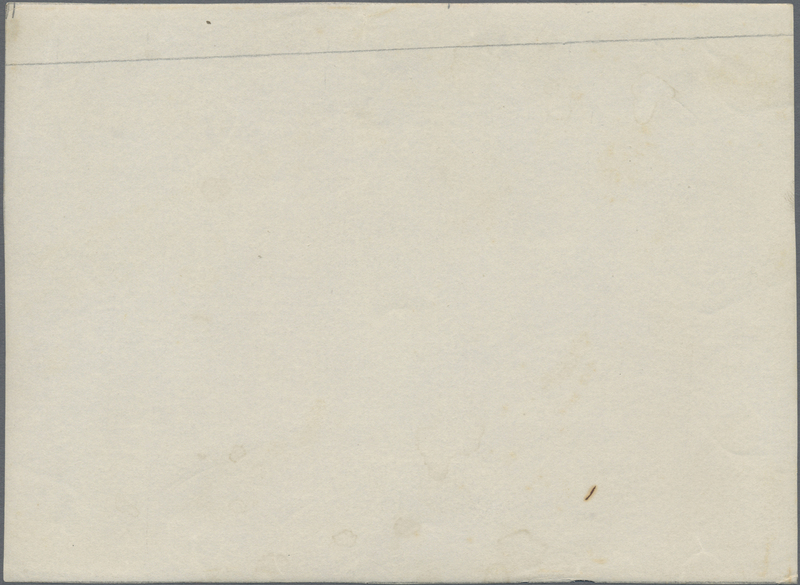 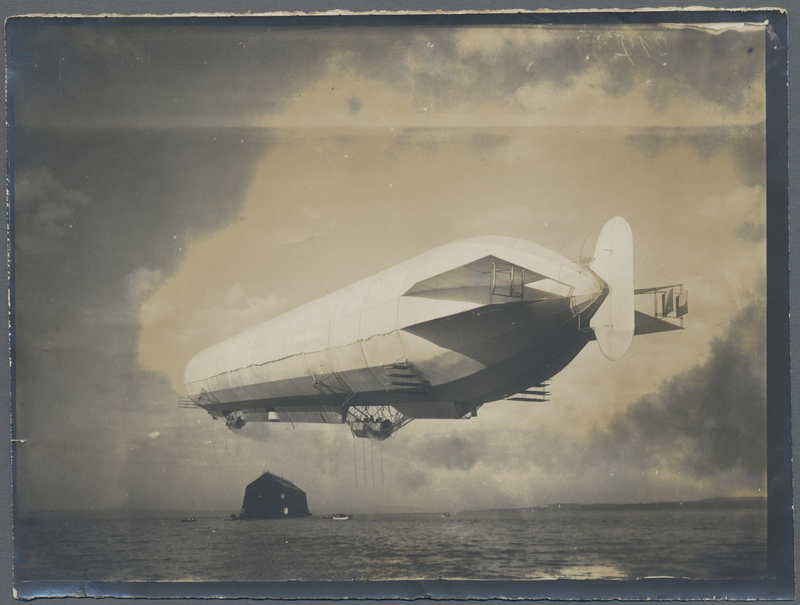 11057 Original, period photograph of an early German Zeppelin airship; a bit worn. 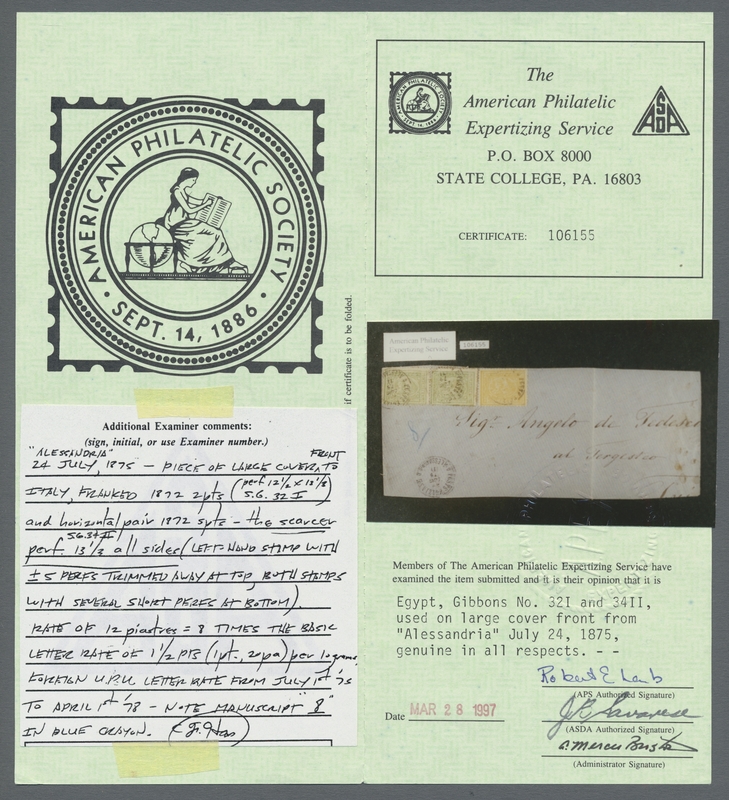 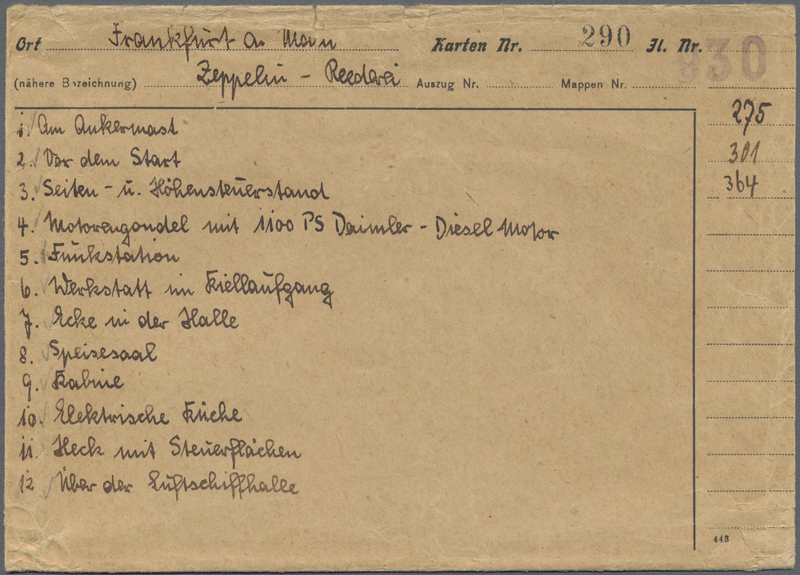 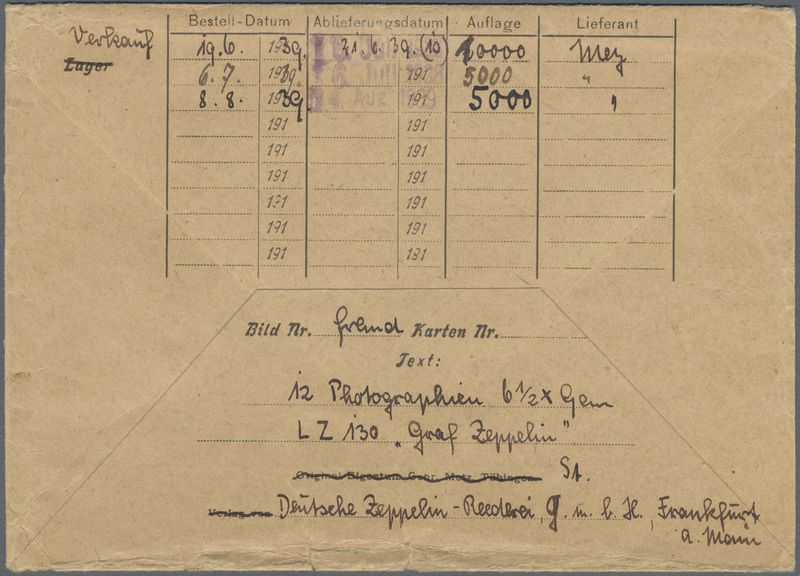 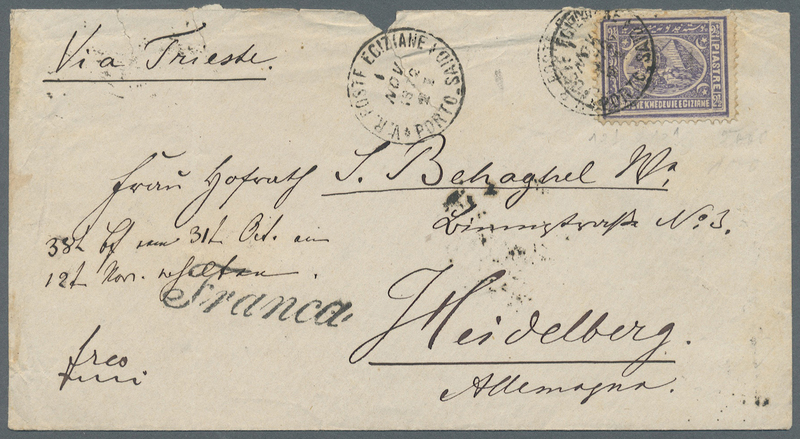 From an advanced early flight collection in a German estate, off the market for years; an excellent collateral piece for the pioneer Zeppelin mail collector. 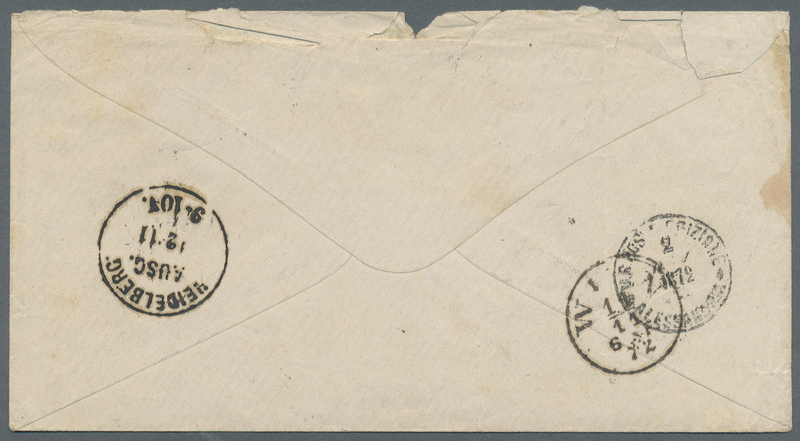 Size ca 16.5x11cm. 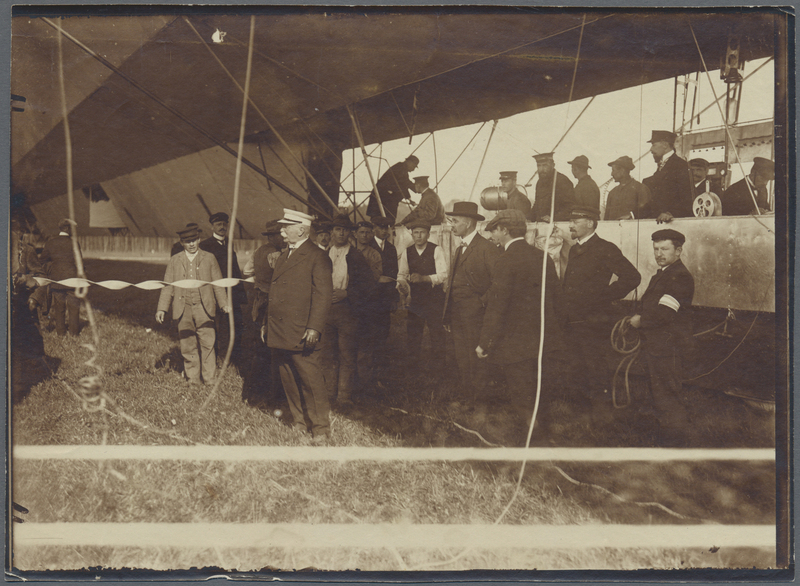 11058 Original, period photograph of airship pioneer Graf Zeppelin in front of one of his early craft with the crew busy inside behind; a bit worn. 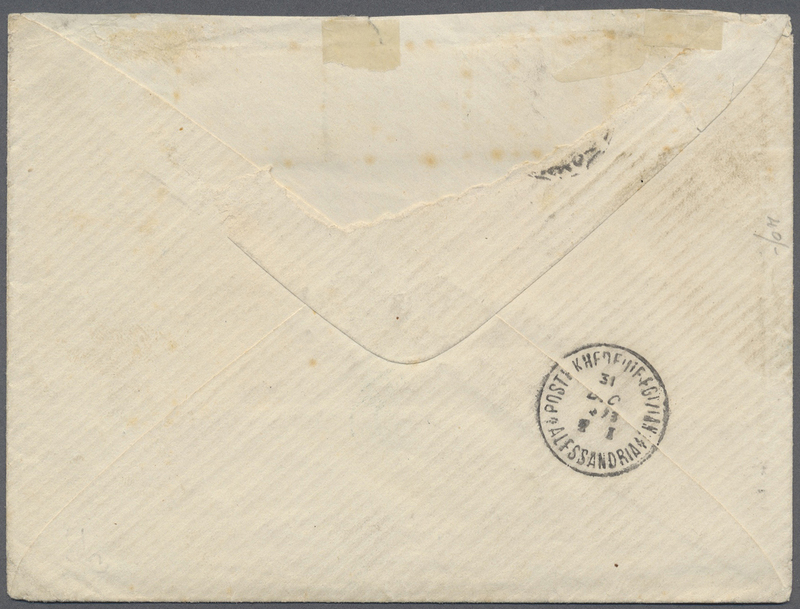 From an advanced early flight collection in a German estate, off the market for years; an excellent collateral piece for the pioneer Zeppelin mail collector. 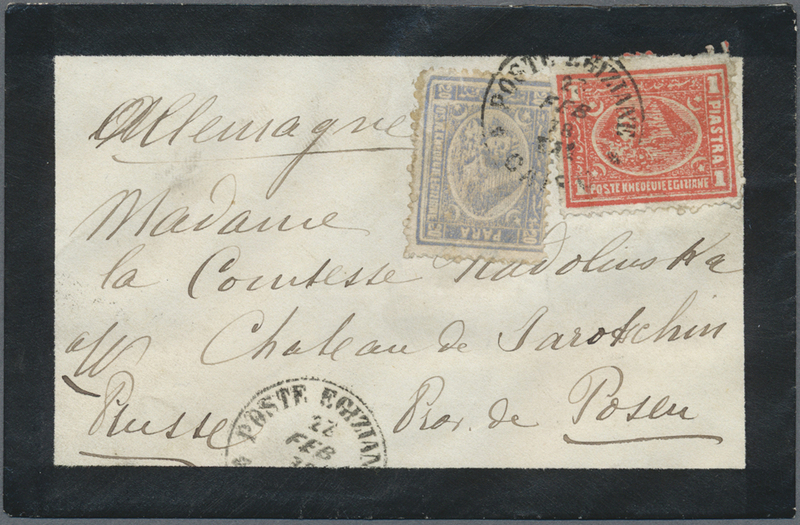 Size ca 18x13cm. 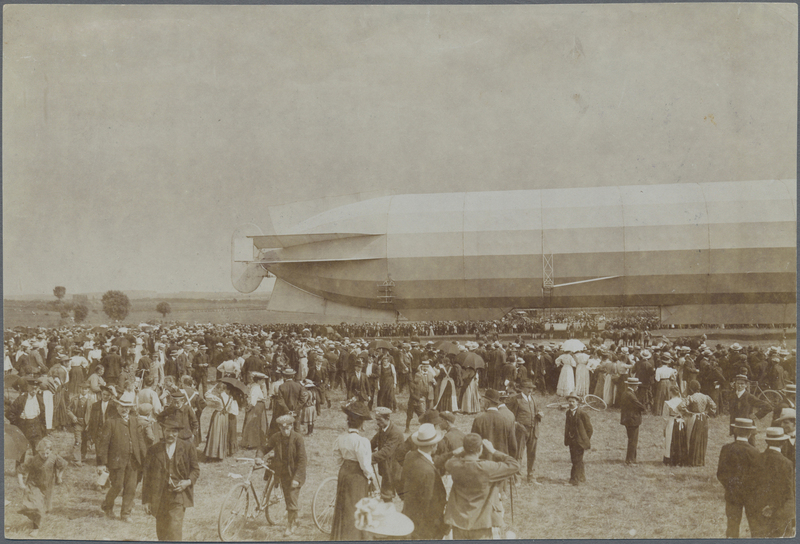 11059 Original photograph of the pioneering German Zeppelin, the LZ4. 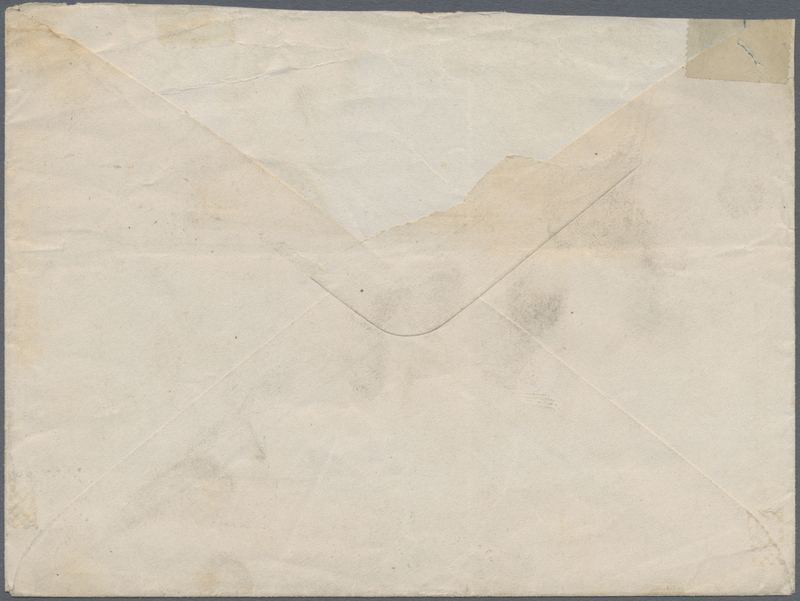 Fairly worn, chipped, wrinkled. 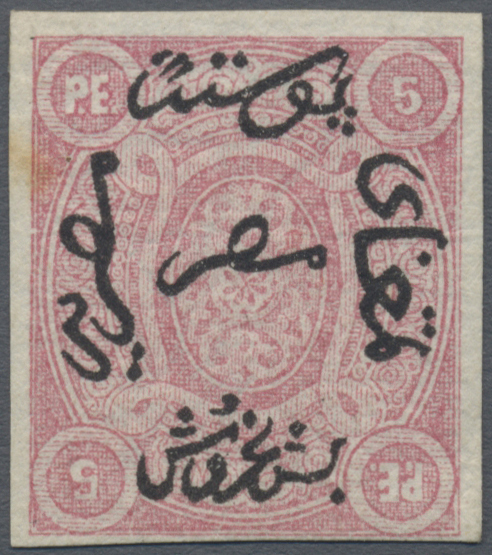 Size ca 18x13cm. 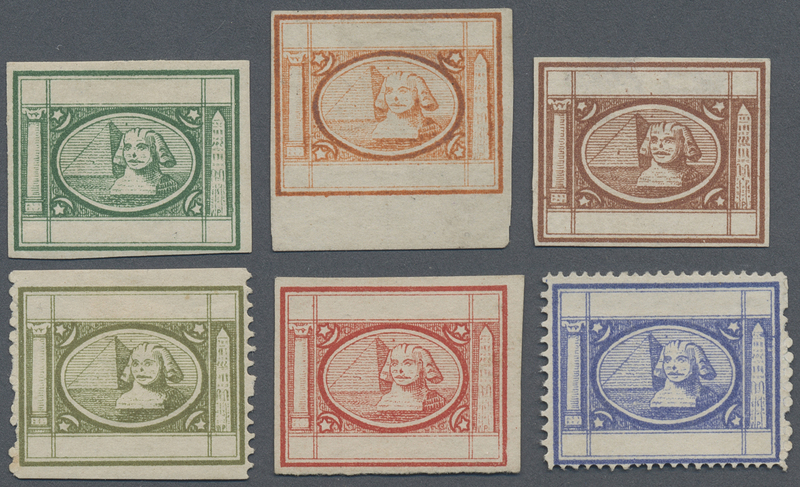 11111 ungebraucht ohne Gummi (unused without gum) (*) Essays 1871, Penasson essays, non-denominated (Nile Post E51), group of four imperforate values in brown, green, red and violet, fresh group; brown shade with tiny thin spot, otherwise Very Fine. 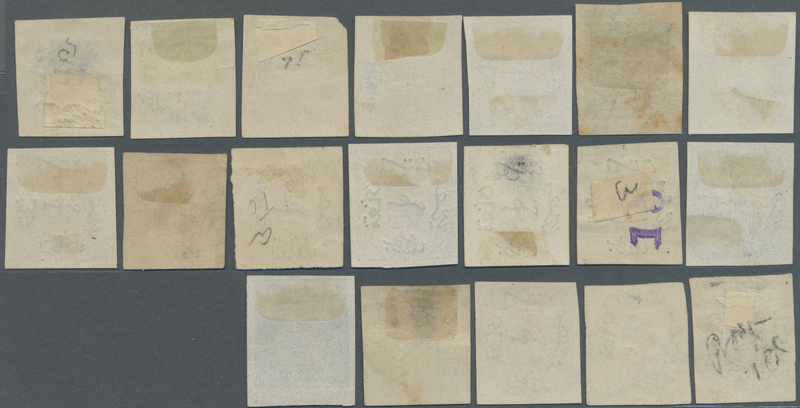 11113 ungebraucht ohne Gummi (unused without gum) (*) Essays 1871 Five Penasson essays for the 3rd issue, no value, imperforated in red, green, olive-green, violet and brown, fine. 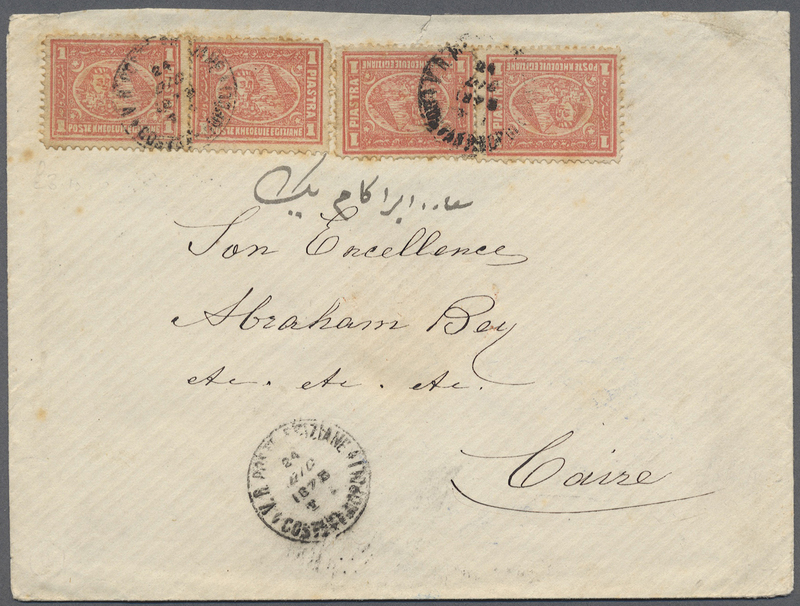 11122 Brief (cover) SG Z67 1873 Cover from SUEZ to ADEN franked by Great Britain 6d. 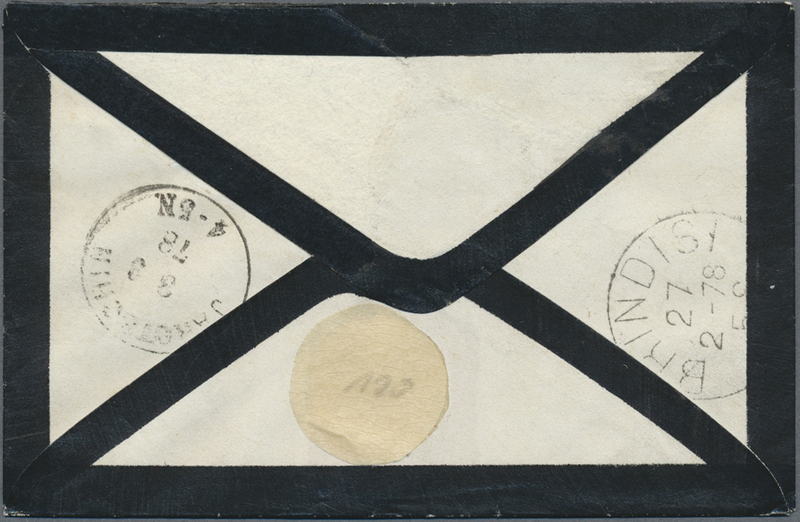 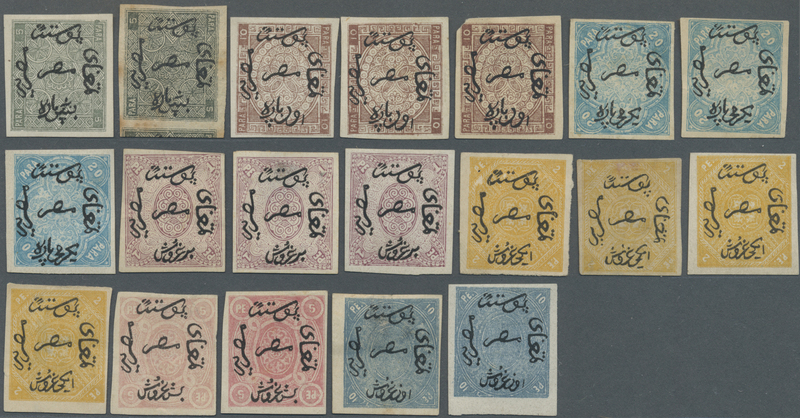 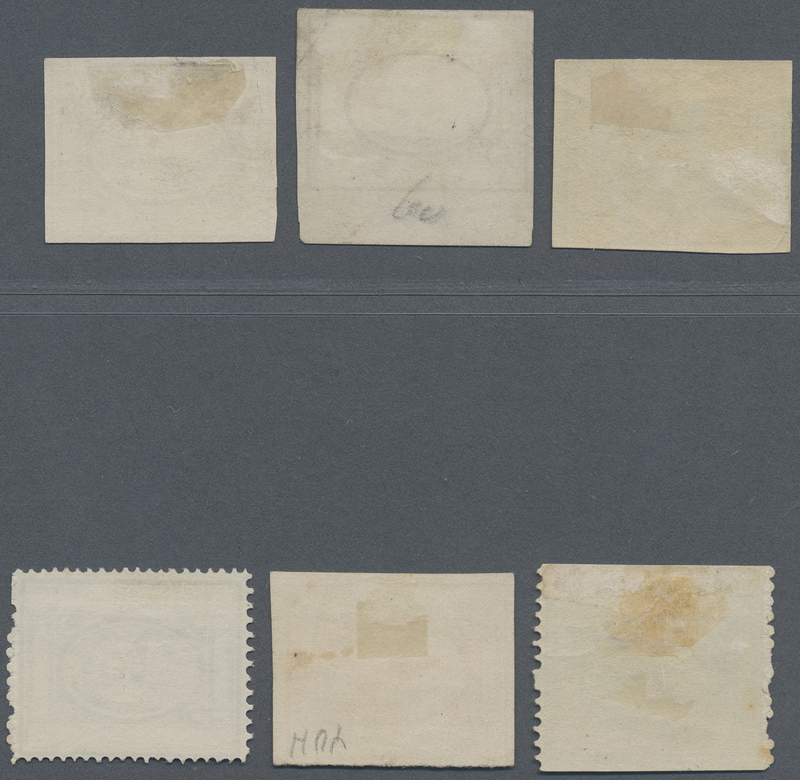 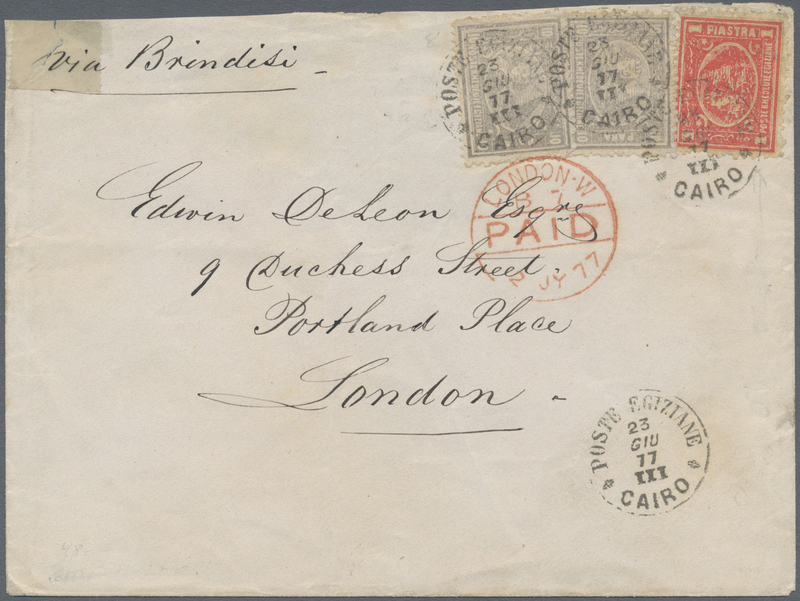 grey (Plate 12) tied by "B02" numeral in oval of bars, with "A/SUEZ/NO 7/73" despatch cds alongside, and with "ADEN STEAMER POINT/NO 16/73" arrival cds on the reverse. 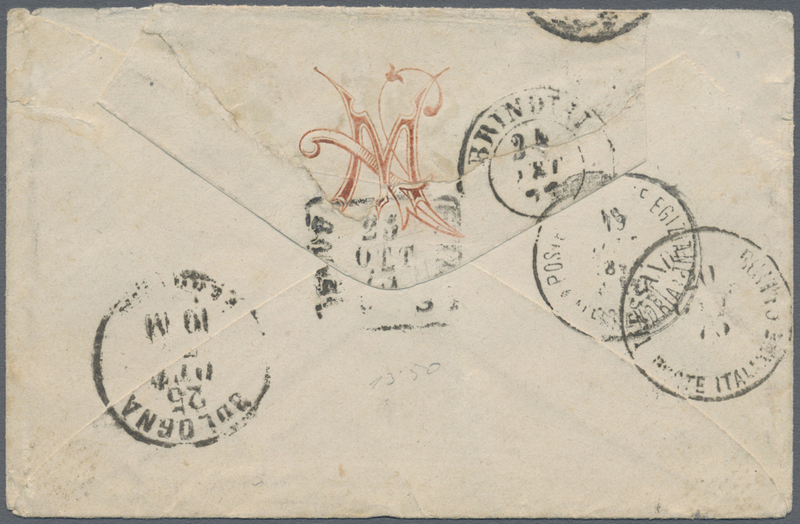 The cover opened at top and at left (faults/imperfections) otherwise fine. 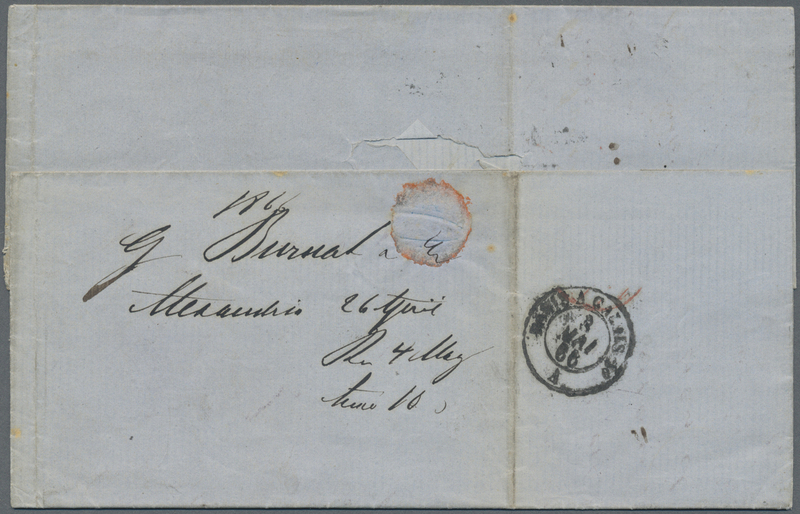 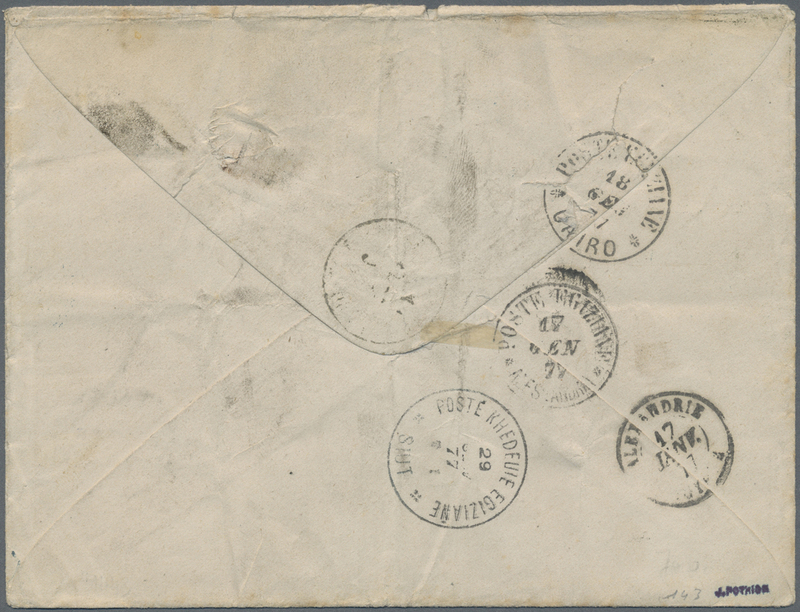 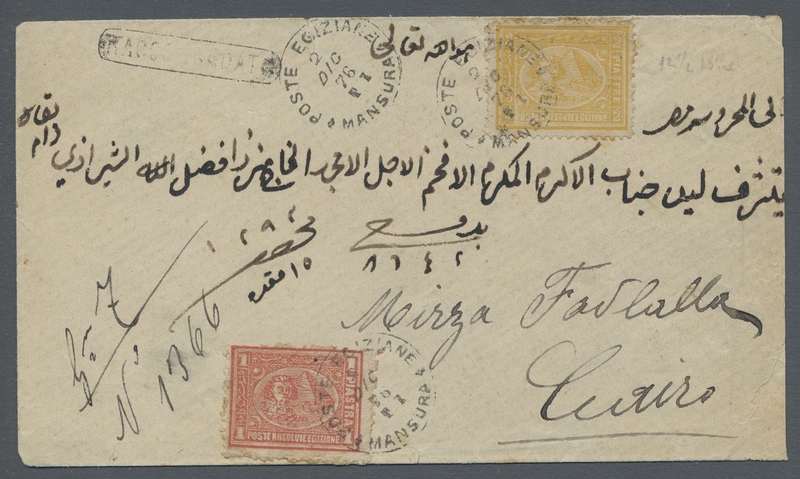 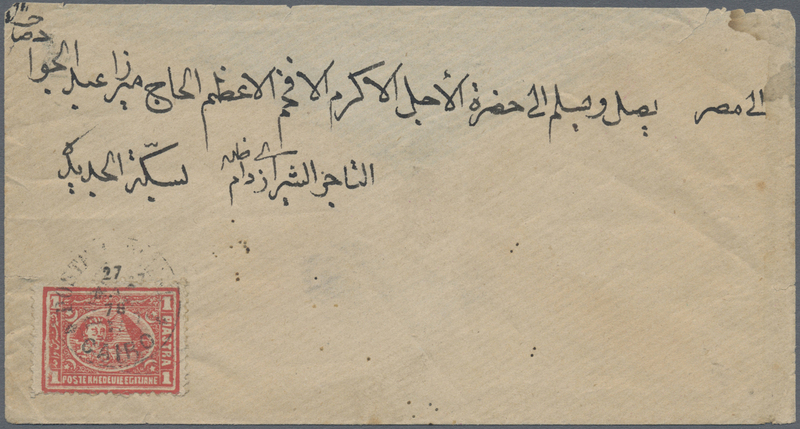 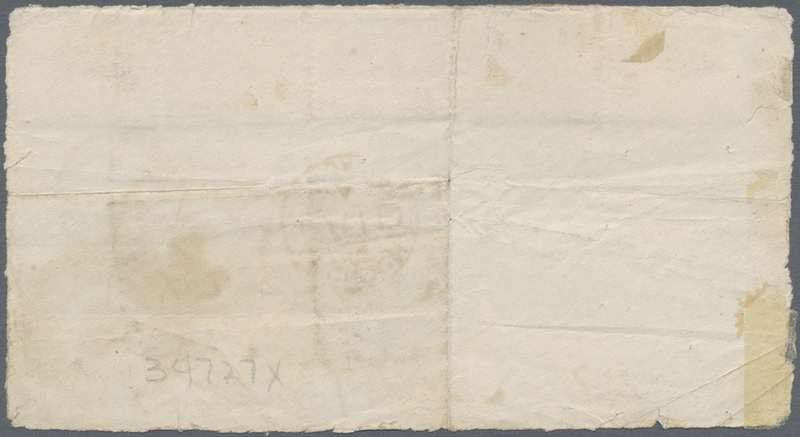 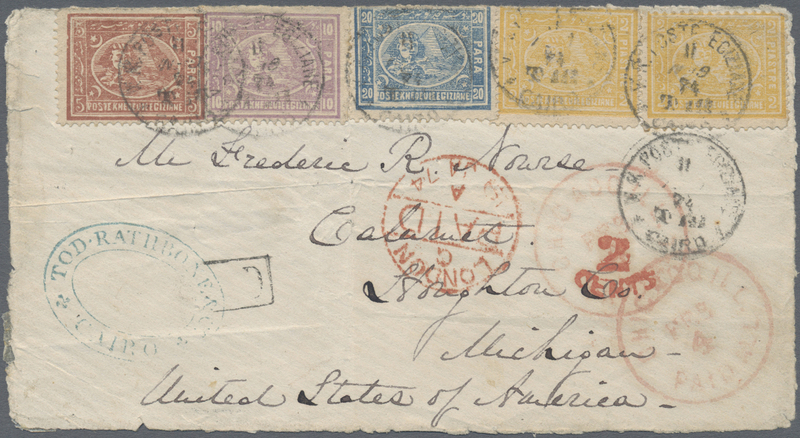 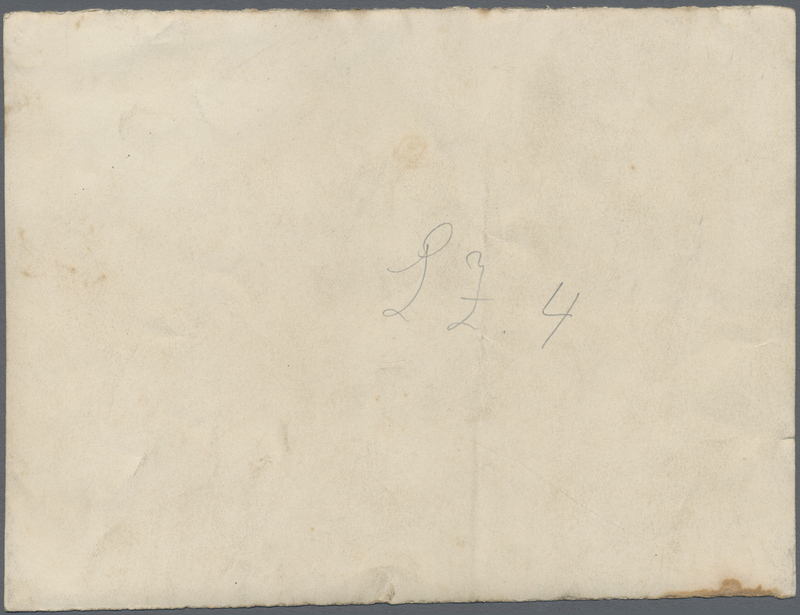 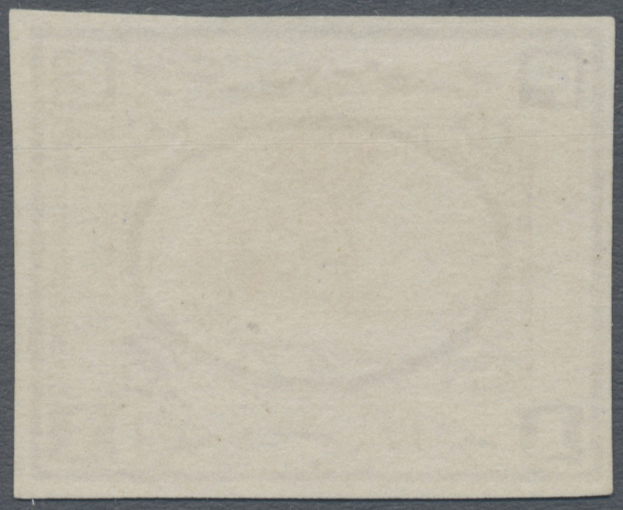 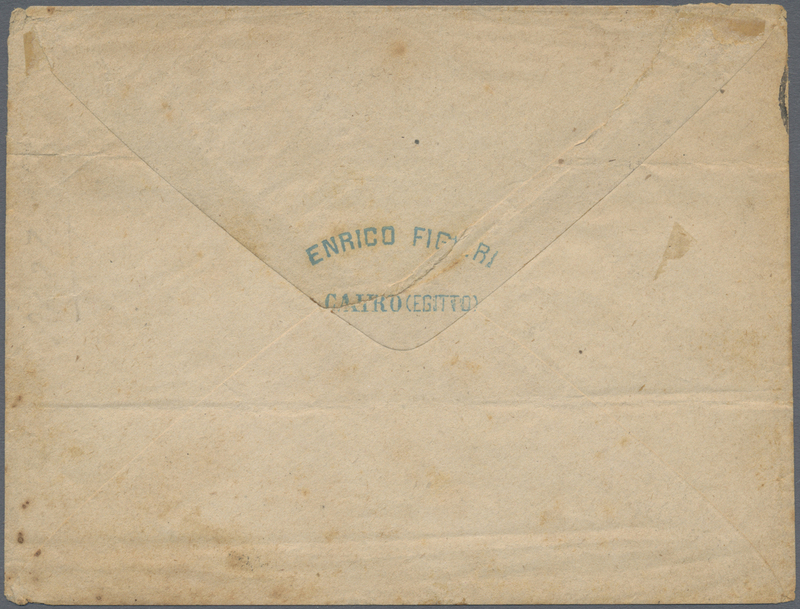 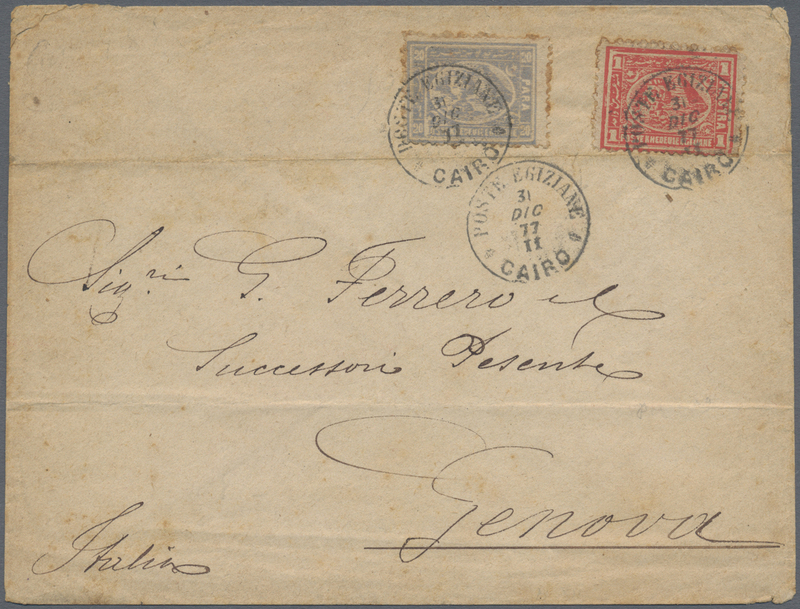 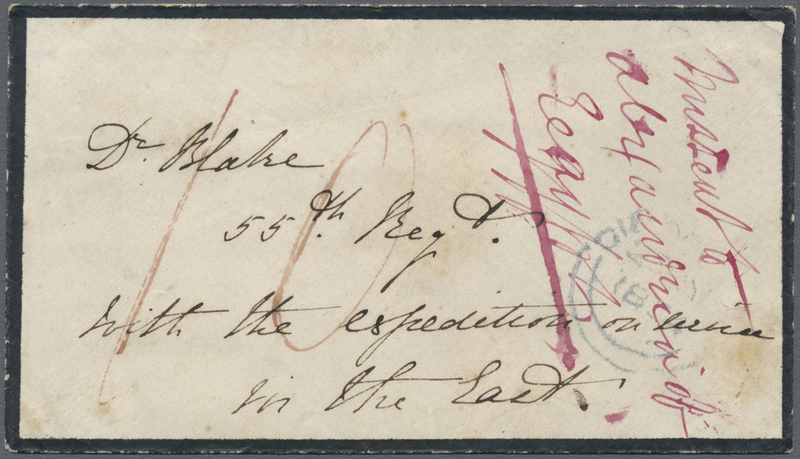 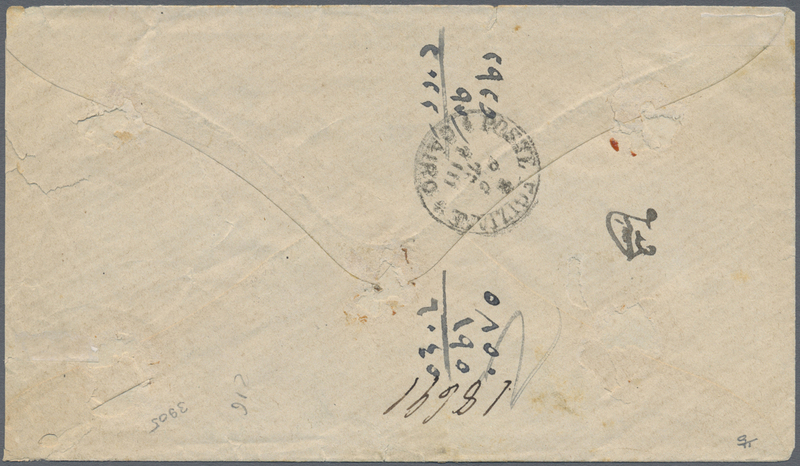 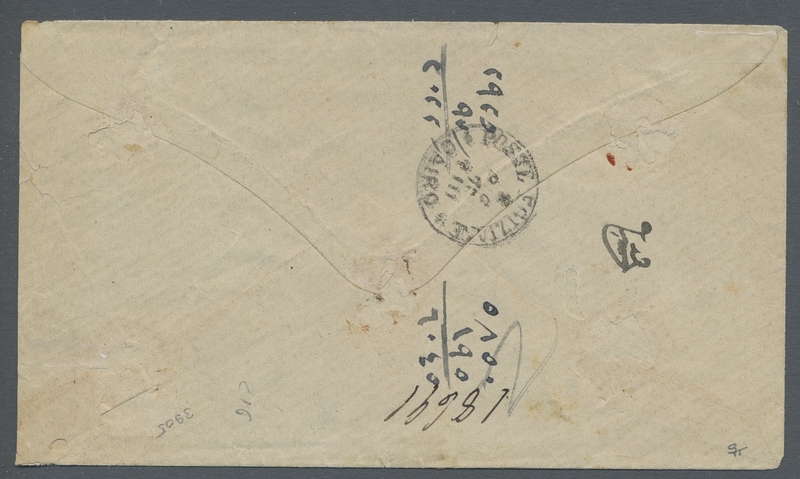 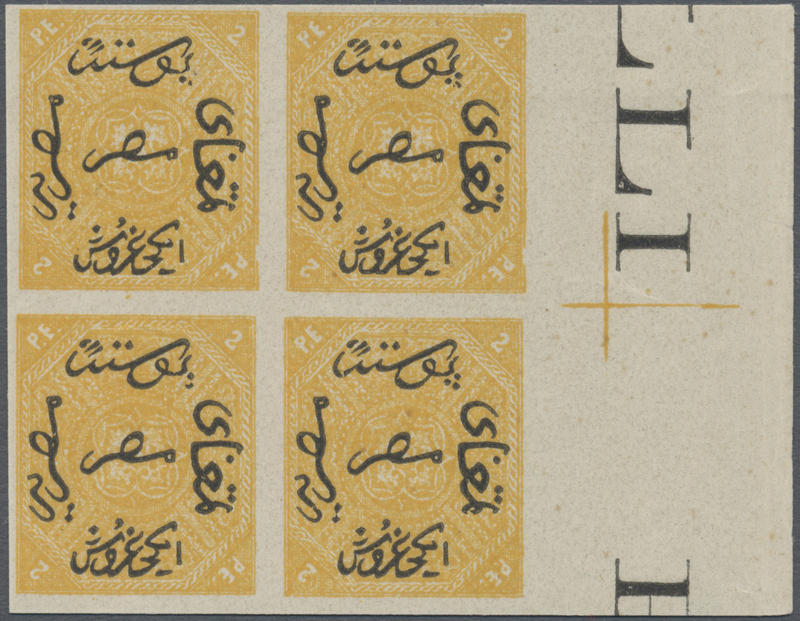 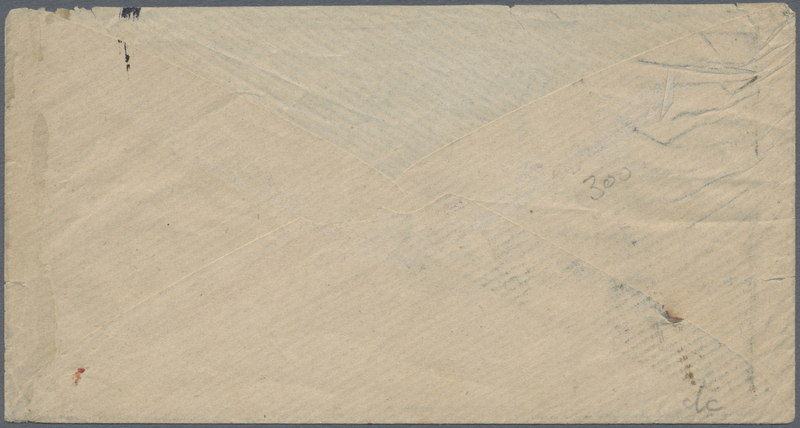 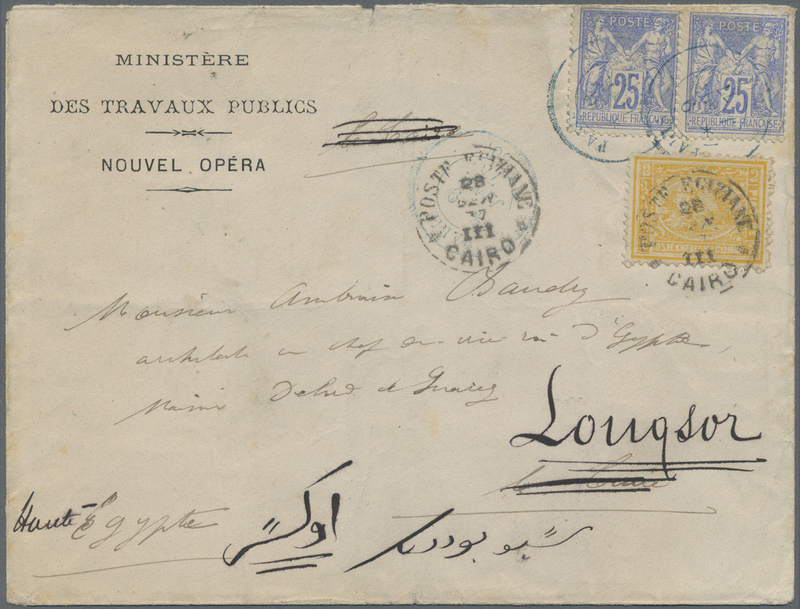 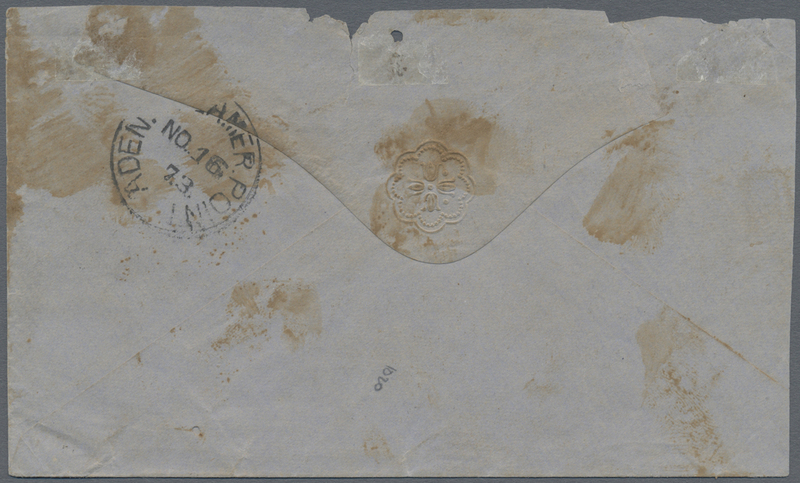 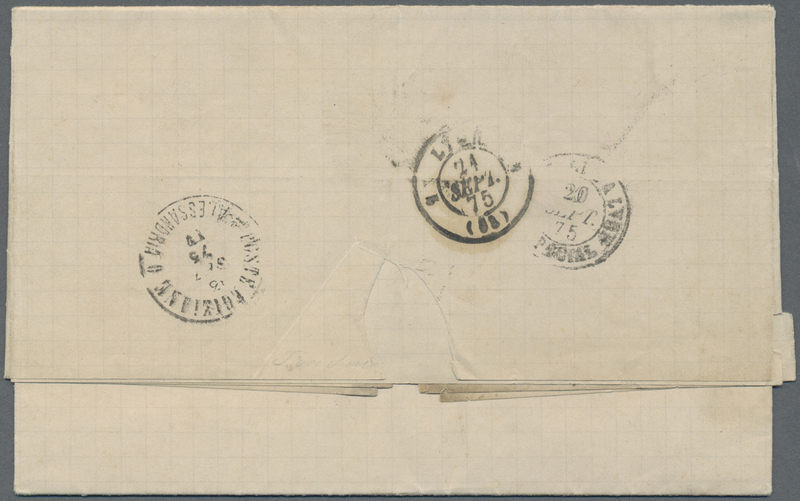 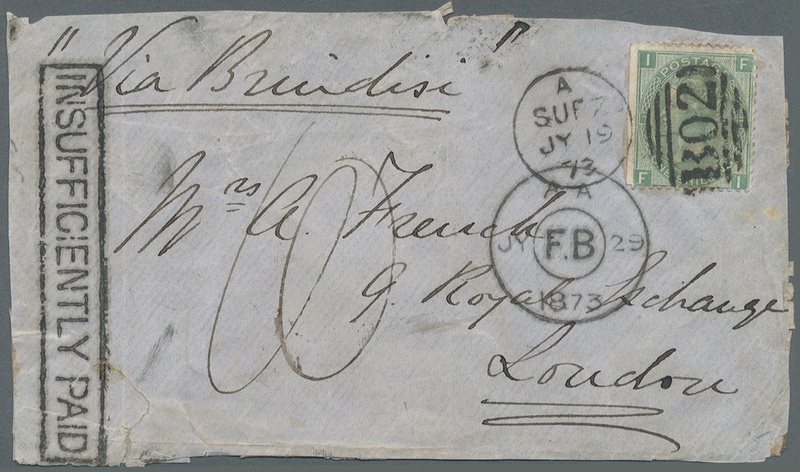 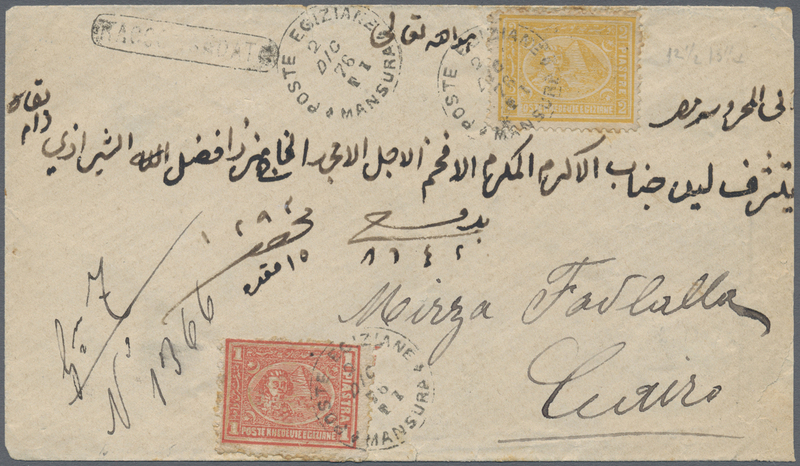 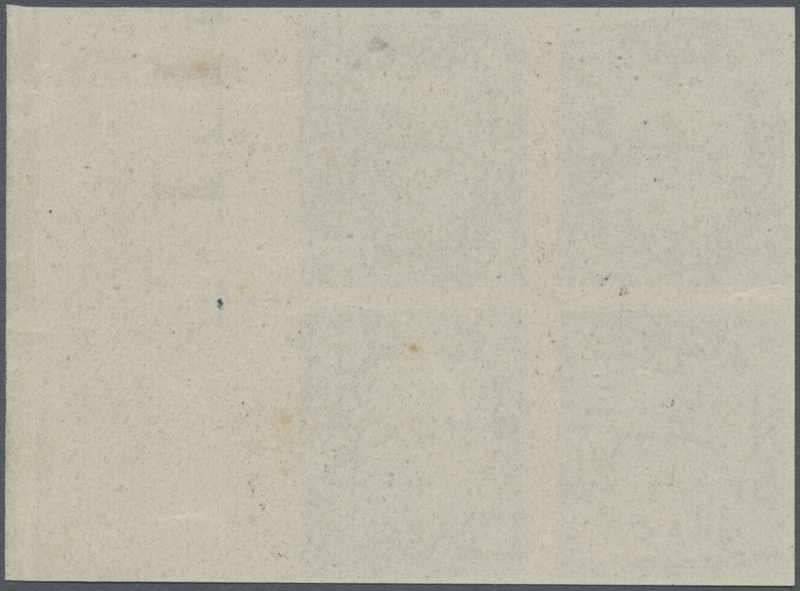 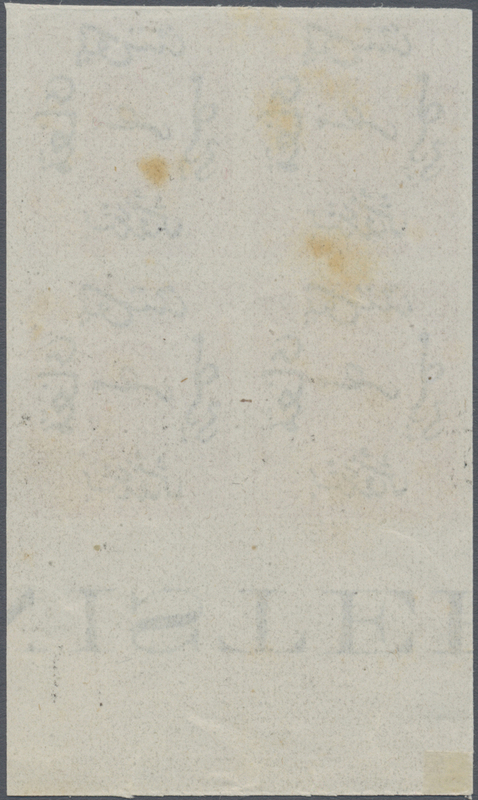 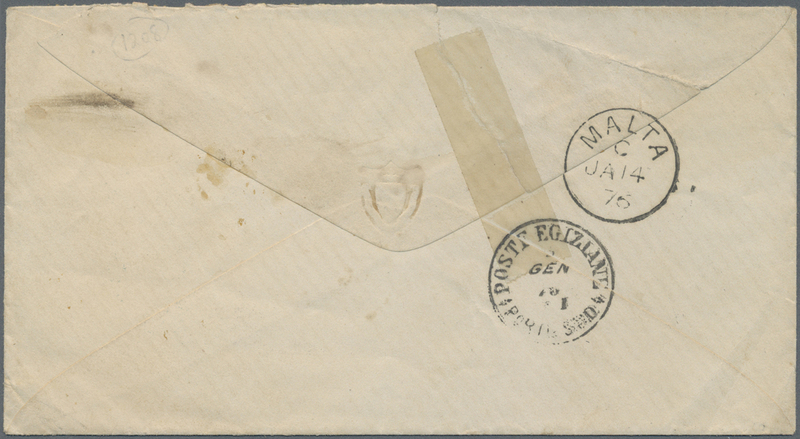 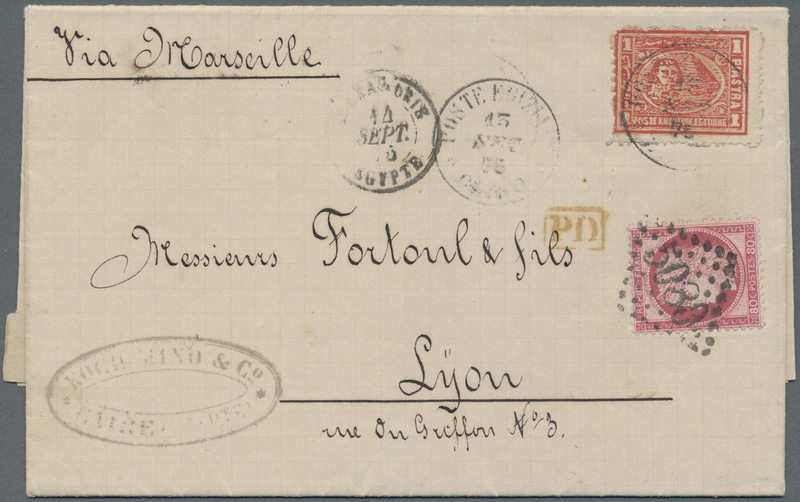 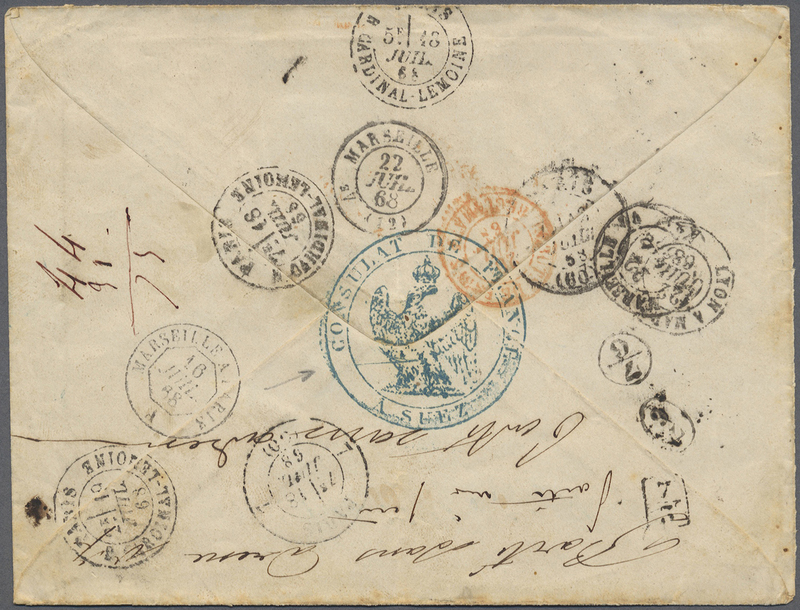 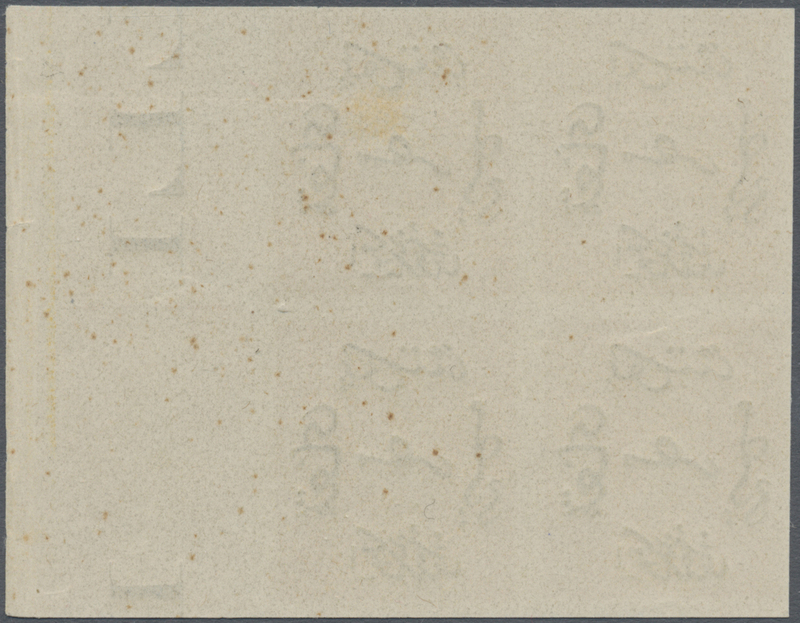 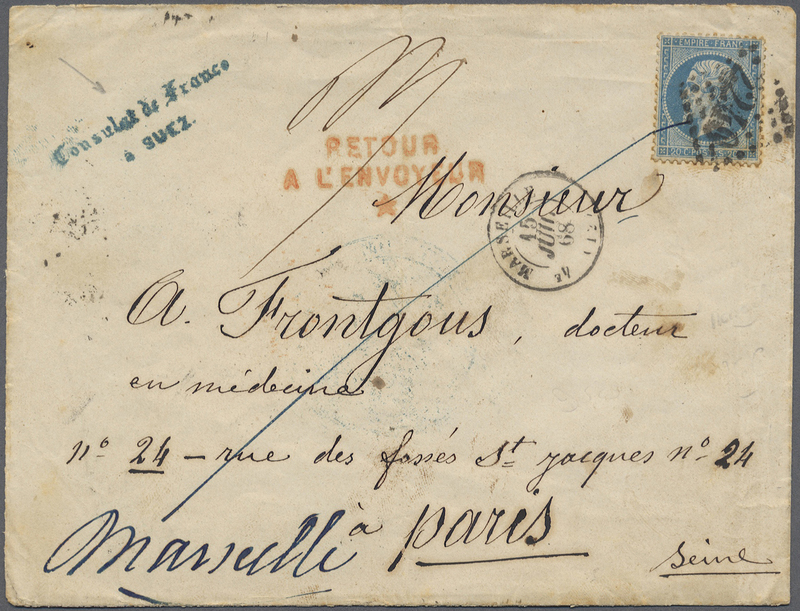 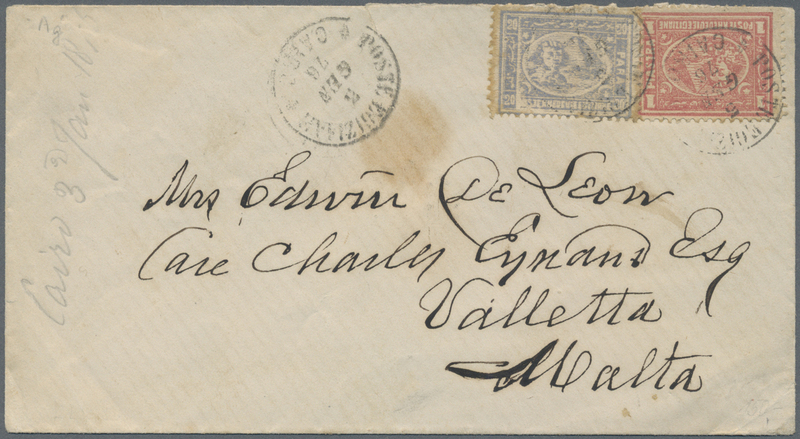 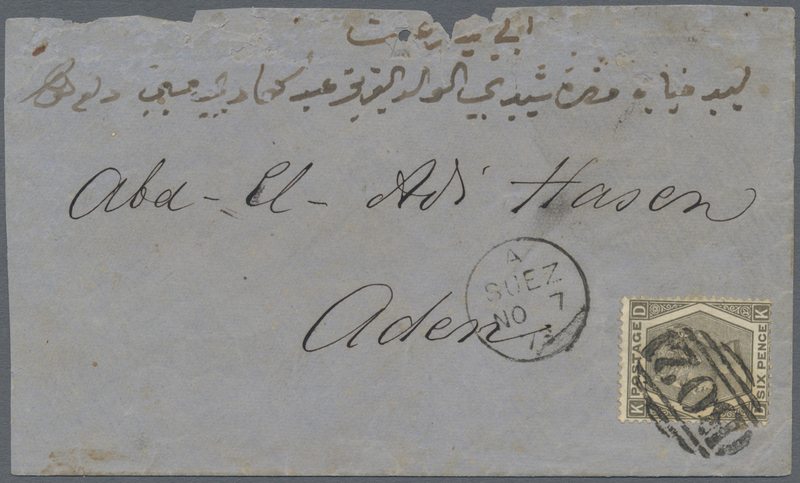 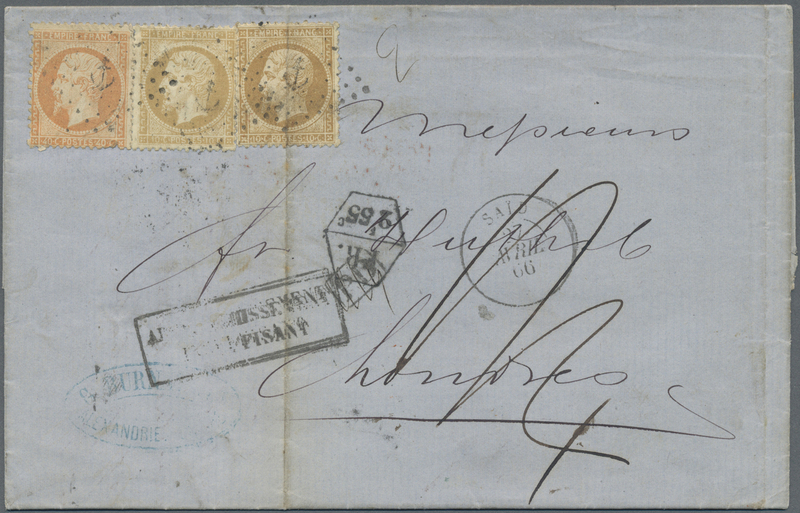 11128 Brief (cover) 16+17 1876 Cover from Cairo to MALTA, franked by 1872-75 20pa. 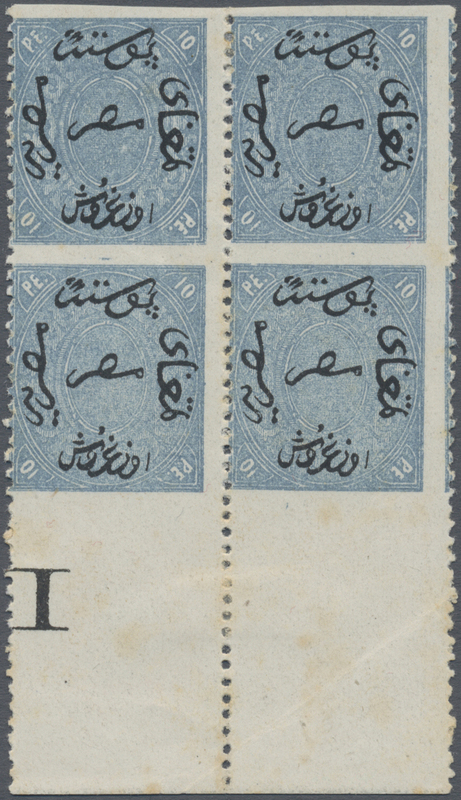 grey-blue and 1pi. 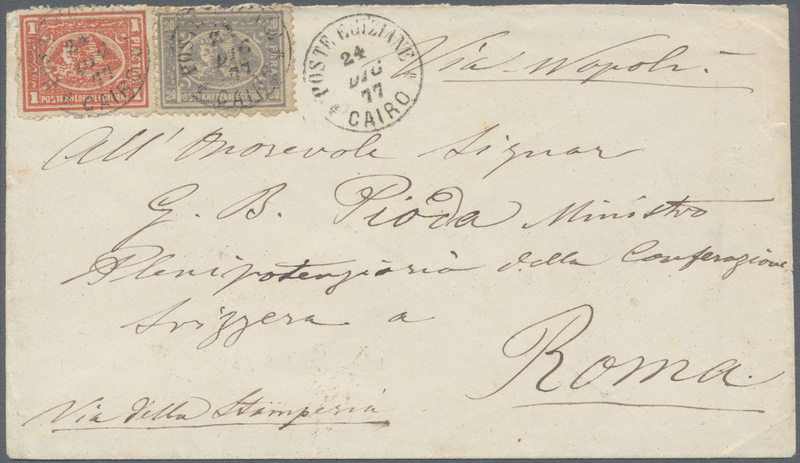 rose tied by "POSTE EGIZIANE CAIRO/3/GEN/76" cds, and on the reverse with Port Said transit dater as well as '14 Jan 76' arrival cds. 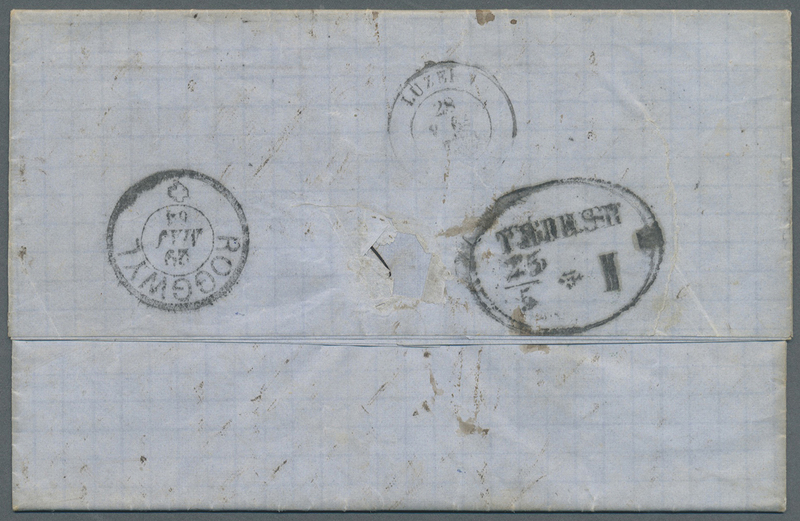 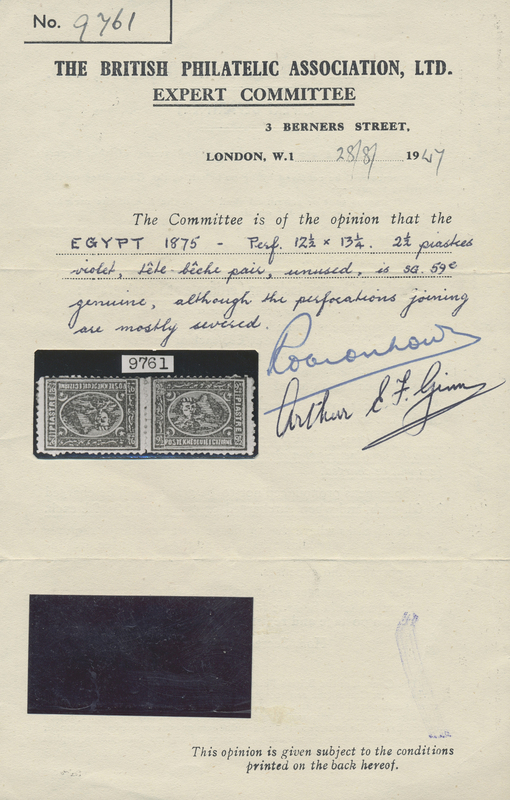 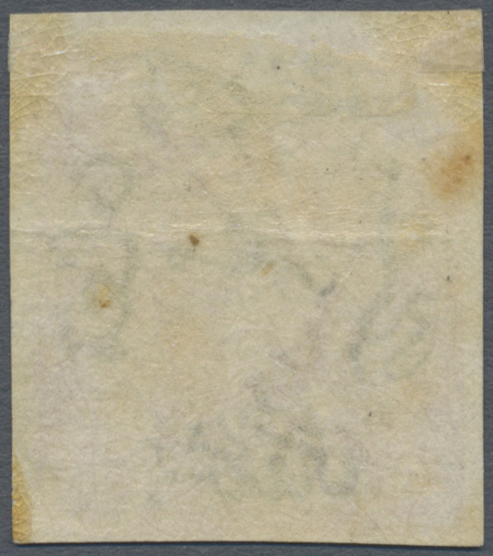 The stamps with usual toned perfs (from the glue) and cover with a tear through back-flap but still an attractive cover, and a scarce destination. 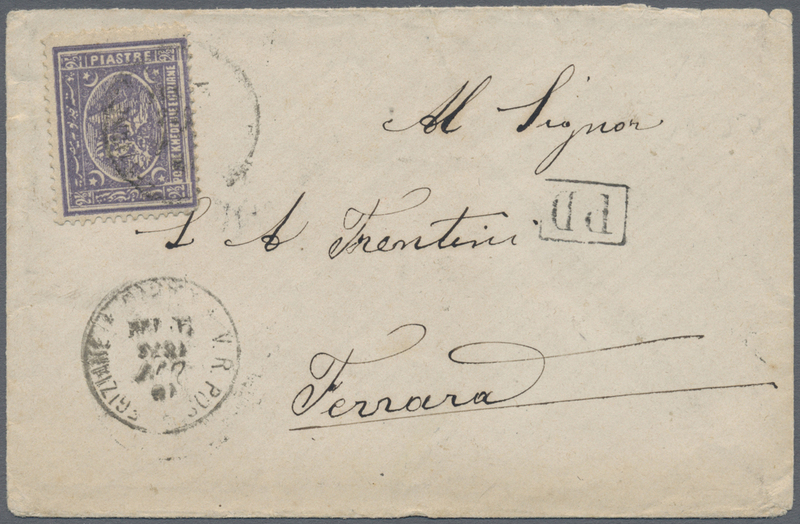 11132 Brief (cover) 17IIyb, 16IIyb 1878, 1 Pia carmine and 20 Para dull greyish blue tied "CARIO 22 FEB 78" to name-card-size mourning cover to Samotschin (Poznan/Posen province), on reverse transit "BRINDISI 27 2 -78" and March 3 arrival of SAMOTSCHIN. 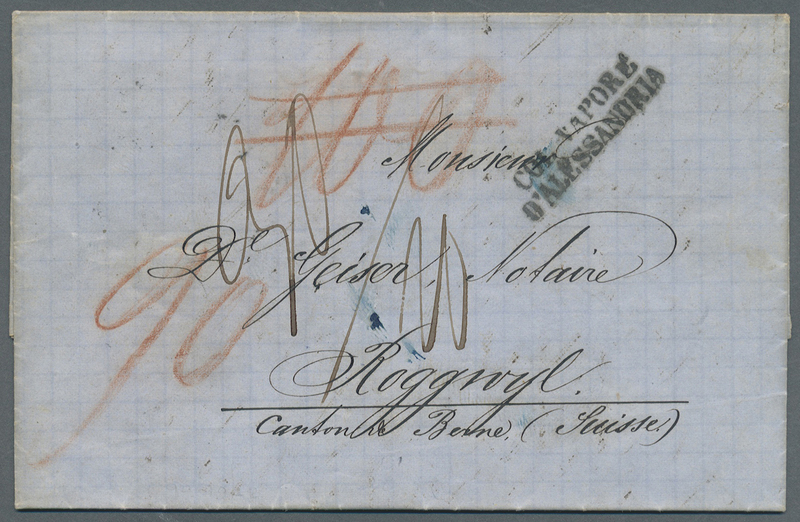 Adressed to "Comtesse Radolinska", Samotschin castle.